Save a PO.... it's FREE! Have you ever wanted to try something new without having to pay for it? We are so confident you will appreciate the numerous benefits of our Mold Solution Products®, you can give them a try on us. You can try a sample of each product for FREE! Free samples are available for the following products. Lecithin Mold Release #1504 - A highly versatile release agent perfect for molding parts that need painting or decoration. Mold Saver #1706 - An excellent corrosion inhibitor that not only eliminates moisture penetration, it displaces any preexisting moisture. Tool Towels #7001 - Designed specifically for the plastic molding and mold building environment, Tool Towels wipe way all particles found in normal molding applications. Mold Cleaner-Degreaser #1605 - A heavy-duty cleaner formulated as a strong, effective remover of plastic resins, greases, paints, oils, and releasing agents. Silicone Mold Release #1302 - Superior mold release for high temperature, pressure and hard to work resins. 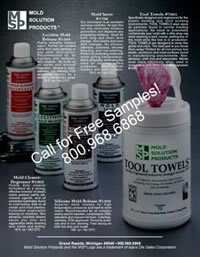 Call us at 800-968-6868 for your free samples (limit 1 of each item).